The Wigwam Motel on Route 66 was built within the city limits of San Bernardino in 1949, a period when citrus groves flourished. The motel would later acquire a Rialto postal address, creating confusions as the property actually sits in San Bernardino. 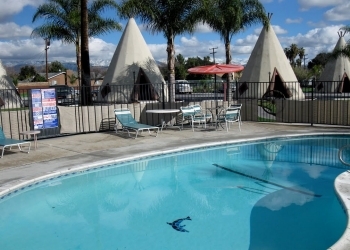 This Teepee Motel is fun for all, located only minutes from Colton, Grand Terrace, Redlands, Big Bear, Highland, Rancho Cucamonga, Fontana, and Bloomington, CA. This location would mark the final of 7 Wigwam Motels that were constructed. 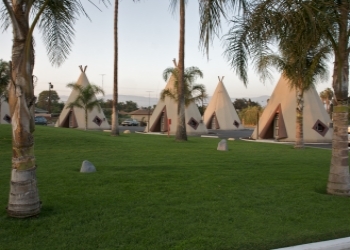 The motel's village-style arrangement of nineteen 30-foot-tall tepees made from wood framing, concrete and stuco draws much admiration from all generations. Each individual wigwam is carefully equipped with all the traveler's essentials with grounds that includes of grass area, an outdoor barbecue grill and kidney-shaped swimming pool. The mastermind behind this retro motel was a clever man by the name of Frank Redford, who was heavily influenced by the native Indian culture. He would bring his imagination to a reality in the early 1930s explained in the following section. A total of only seven Wigwam Motels were built throughout the nation, of which three managed to remain preserved. Two of the last three remaining rest along historic Route 66 in the states of Arizona and California, while the other rests in Redford's home state of Kentucky. View our favorite links page to learn of the other 2 remaining Wigwam Motels. The remodeled classic motel continues to live on going on for over 60 years through the support of car enthusiasts, families, foreigners, historians, preservationists, roadies, tourists, travelers and many others for generations to come. Share a piece of history with your friends and family by surprising them to a stay in a Wigwam!